Portland Self Storage at 11318 SW Barbur Blvd. Located on SW Barbur Blvd. between Pacific Hwy. W and SW. Capitol Hwy., Extra Space Storage serves Portland residents near Villa Ridge, West Portland Park, Crestwood, Oak Creek, Mt. Park, and Arnold Creek. Locals will recognize our facility near Comfort Suites Southwest next to I-5. We're also accessible for residents of nearby apartments, such as Ashcreek Commons, Woodside Vista Apartments, Gettysburg Apartment, Capitola Commons Apartments, and The Bluffs at Mountain Park. Extra Space Storage on SW Barbur Blvd. offers a wide range of storage units and amenities like heated storage and climate-controlled storage. 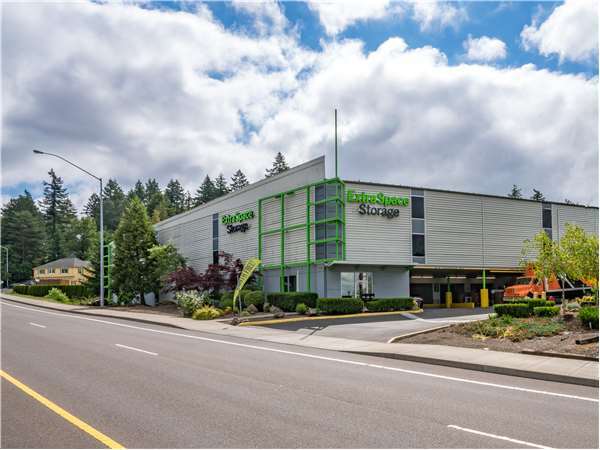 We're your ideal self storage partner in Portland! With storage unit sizes ranging from as small as 4 square feet to as large as 300 square feet, our Portland storage facility can accommodate needs of all sizes. Unit features include indoor access, first-floor access, elevator access, climate control, and heated storage. If you're worried about extreme heat or extreme cold damaging your belongings in storage, we have options for you! We offer climate-controlled storage units in sizes 4x2 to 10x20. This amenity keeps your unit between 55?F and 85?F at all times. We also have heated storage units in sizes 4x1 to 10x30. This feature prevents your unit's temperature from dropping below a certain temperature. Need a space to conduct business or civic meetings? Our Portland location has a meeting room available! Contact our staff for more information or to reserve the room. With security access to your floor only, electronic gate access, and 24-hour video surveillance, our SW Barbur Blvd. storage facility provides the secure storage environment you want for your belongings. At Extra Space Storage, we're committed to providing the storage solution you need with the customer service you deserve. With a friendly, professional staff dedicated to helping with whatever you need and a clean, secure facility, you know you're getting the best when you rent with us. Contact us today to reserve a storage unit in Portland! Facilities are as advertised but the lady at the front desk really made the experience nice. The location, price and security are what sold us on this particular storage unit. It is clean and very easy to use. As a single woman, I feel very comfortable accessing my unit after hours. The units were clean, secured and reasonably priced. I was helped by Brad and he was absolutely awesome!! He gave me great recommendations that worked better than my initial reservation. He was very courteous, friendly and thorough. I wish i had someone like him everywhere i went! Extra Space Storage is quick and the way to go. Great customer service very nice clean and friendly highly recommended. We have been so pleased with Extra Space Storage. They are very helpful and have big carts that you can use to help get your items in the space. I would definitely recommend using them. . This location feels clean and safe. I appreciate all the security measures they have in place. I feel like the price is reasonable and I'm glad they don't charge only monthly rates. The manager, Michelle, was very helpful and kind as well. My only issue is that there is only one loading elevator and when it's busy, it takes a long time to move my things in/out. Otherwise, I highly recommend it. Service was very prompt, polite and helpful. So far I love using the unit I have at extra space. Looking forward to taking more storage tubs there soon as I get a moment :) It sure is relieving to know our belongings are safe and secure. I like how close the location is to our home also. Makes it easy to run and get something out, if I need to. After looking at other storage facilities and receiving poor customer service, we chose Extra Space. The store associate at Extra Space made it a very smooth transaction. In addition we found the location to be convenient, easy to access at all hours, well-lighted, and secure. Extra Space Storage has lifted the bar in self storage facilities. Our manager Michelle is the very best at matching a client to a unit. She was extremely helpful in our move. Great place for storage. Feels very safe, clean, and easily accesible. Well lit and like the music that is piped in. Very helpful staff also. Michelle is great at her job. For about 2 weeks I noticed she literally ran the storage facility on her own. The facility was always clean and even without AC on 100+ degree days she maintained a positive upbeat attitude. I had a problem with an odor close to my storage unit originating from a misc spill and she took care of it right away. This is a great facility with a caring staff and I'm glad to have found it. I just want to say that I a very happy with Extra Space on Barbour Blvd and in particular Michelle Baughman who is a true customer service professional. I have rented from some storage facilities where you could tell the employees thought of you as a sort of nuisance, but not here. Sitting in a hot office all day with no ac she still manages to keep an upbeat attitude and a smile on her face. I feel welcome when I go into the office to ask questions about my acct, and even though I noticed she's literally running the place by herself the facility is still clean as a whistle which is important to me. I'd have to say Michelle is one of the highlights of renting here. Good job on having great employees. Promote her! It was so easy to rent a storage unit with ExtraSpace Storage. Everyone in the office is great to work with. The building and the units are super clean. The space is on the main floor and when we moved our items in, it went very quickly. Our movers were very impressed as well. This storage place is exceptionally clean and well managed. Staff are helpful. Good place to store your stuff. Steve at extra space storage was very helpful, he went above and beyond to help us out. He showed us around and helped us with our moving supplies. We really enjoyed his help. I was happy to see that Extra Space had just the right amount of space I needed. The 5x10 is a unique size and not all storage places offer this size. Also, I have only done business with Extra Space in the past. I've used them on both the East and West coast and they are consistently professional. Very friendly and helpful employees. Clean facilities and well maintained. Drive southwest on I-5 S. Take Exit 293. Keep right and follow signs for P.E.R.S. Merge onto SW 68th Ave. Turn right onto SW Atlanta St. Continue on SW Haines St. Turn left onto SW Lesser Rd. Turn left onto SW Capitol Hwy. Turn right onto SW 60th Ave. Turn right onto SW Barbur Blvd. Our facility will be immediately on your right. Drive north on I-5 N. Take Exit 294. Our facility will be on your right at the end of the ramp. Drive southwest on SW Barbur Blvd/Pacific Hwy W. Turn left onto SW 60th Ave. Turn left onto the ramp. Our facility will be on your right at the end of the ramp. Drive southeast on Beaverton Tigard Hwy. Take Exit 6. Turn left onto Pacific Hwy W. Turn right onto SW 60th Ave. Turn left onto the ramp. Our facility will be on your right at the end of the ramp.